Welcome to my Composite Design Pattern Tutorial! 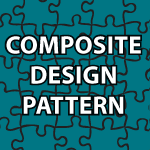 The Composite design pattern is used to structure data into its individual parts as well as represent the inner workings of every part of a larger object. The composite pattern also allows you to treat both groups of parts in the same way as you treat the parts polymorphically. This allows your objects to maximize complexity while also remaining dynamic. All of the code follows the video to help you learn. It is heavily commented. This website rocks! There is so much good information here. Thanks for making JAVA easy to understand! I have a Q: How come a “throws” statement, is not required from methods of the abstract class SongComponent ? Dude, I’m from Chile. You’re helping the entire world with your vids. How awesome is that? Thank you very much 🙂 It is extremely gratifying to help and speak with people all over the world! Thank you very much for these videos. I learn a lot. You’re very welcome 🙂 I’m happy that you are enjoying them. Really nice tutorial. This explains the Pattern and code so well. Thanks a lot! I’m from Brasil and your video help me a lot in my work school. Thank you. Hey Derek, first of all, thank you so much. But, i’m a little bit confused with this pattern. Can you create a UML Class Diagram with this example and with an UML Object Diagram? Cause I don’t know how to represents “Heavey Metal” “Industrial” and “Dubstep” in the diagram.